The authors strongly communicate a case for ‘Art’ in the primary classroom. 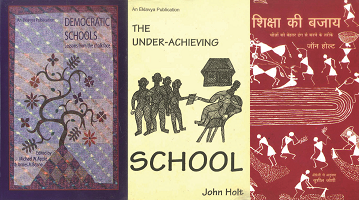 They demonstrate that ar..
भारत में शिक्षा और लेकतंत्र के रिश्‍तों को लेकर उठने वाली बहुत-सी समस्‍याओं और बहसों जैसी समस्‍याएं .. The stories of the experiments carried out in different countries to make educ.. The book offers a coherent, exhaustive account of Julia W. Gordon’s journey as a teacher in a one-te..
पदार्थों के रासायनिक गुणधर्म और रासायनिक परिवर्तनों को समझने के लिए गतिविधियों और प्रयोगों का ठोस अन..
Never a Dull Moment is an insider's narrative of a historic engagement with school education. From 1.. This brief study considers the recommendations of the 2005 National Curriculum Framework and Nationa..
What is the role of a story in a child’s life? How can we make reading meaningful and fun for young ..